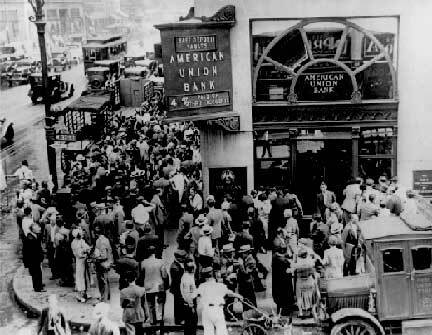 Crowd at New York's American Union Bank during a bank run early in the Great Depression that began in 1929. The bank opened in 1917, and went out of business on June 30, 1931. Image source Wikipedia. 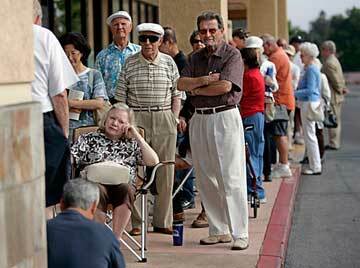 Crowd at IndyMac Bank in Pasadena, California, on Friday, July 11, 2008, after the federal government took control in the second-largest bank failure in U. S. history. Financial experts predicted at least 50 to 100 bank failures in the United States after IndyMac Bank. Updated 11:00 PM EDT September 17, 2008 - Dow closed 450 down today in continuing “Economic 9/11,” after Feds loan AIG $85 billion and oil and metals spiked upward. “Right now, citizens don't trust banks and bankers don't trust other bankers. The financial system is freezing up,” said a CNBC Business Network analyst. Investors also considered a report on new home construction that showed that housing starts dipped to a 17-year low. Further, the FDIC website lists 11 bank failures in 2008 since April, the latest being Silver State Bank in Henderson, Nevada, on September 5, 2008. The Pasadena, California, IndyMac Bank FDIC takeover on July 11, 2008, was the second largest bank failure in American history.